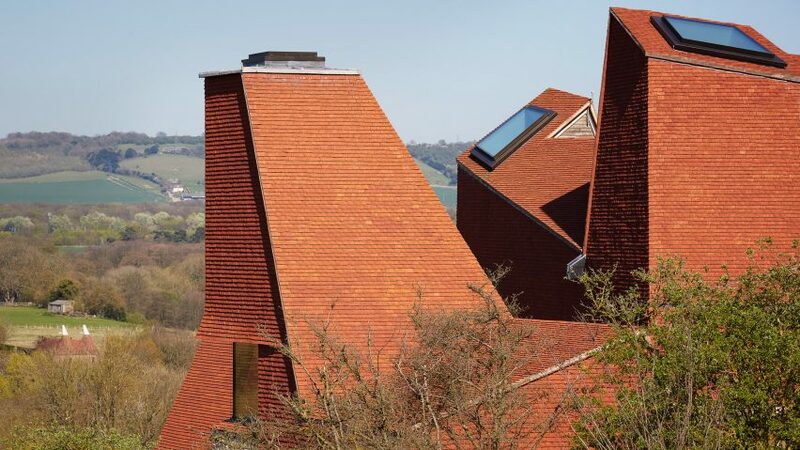 A home referencing the hop-drying towers of the Kent countryside, designed by British architects James Macdonald Wright and Niall Maxwell, has won the RIBA House of the Year 2017 competition. The House of the Year title – formerly known as the RIBA Manser Medal – is awarded by the Royal Institute of British Architects for the best new house or extension in the UK. Architects James Macdonald Wright of Macdonald Wright Architects and Niall Maxwell of Rural Office for Architecture completed the winning project, Caring Wood, earlier this year. Described by the jury as a "brave" new prototype for multi-generational living, the house provides a home for three generations of one family. It is divided into four interconnected blocks representing the four units of the family: the owners and their daughters' husbands and children. The angular roofs of the blocks are covered in terracotta-toned clay tiles, while the connected base is faced in rag-stone from a nearby quarry. The form and materials refer to the region's oast houses, used to dry hops in preparation for the brewing process. "This ambitious house explores new architectural methods, materials and crafts and allows us to question the future of housing and the concept of multi-generational living," said RIBA president Ben Derbyshire. "I've no doubt many of the ideas displayed at Caring Wood will influence UK housing for many years to come." The shortlist for the RIBA House of the Year 2017 has been announced over four episodes of the Channel 4 programme Grand Designs: House of the Year presented by Kevin McCloud. Caring Wood was unveiled as the winner during the final show tonight. The project was selected by a jury chaired by the director of London studio DSDHA, Deborah Saunt. The winner of last year's award, Richard Murphy, also sat on the panel, alongside designer Sebastian Cox, Sandra Coppin of Coppin Dockray Architects, and Jenny Eclair, a writer and the client of the 2005 RIBA Manser Medal-winning house. The judges praised the architects' ability to lend the 1,400-square-metre dwelling a feeling of homeliness in spite of its scale, saying they "manipulated space and scale to balance the need for grandeur with intimacy". They said the design, which sees the extended family share living spaces arranged around a central courtyard, offers solutions for the UK's housing crisis, allowing families to share the load of childcare and allowing family units to remain together for longer. "Beyond the impression of sublime craftsmanship and spatial grandeur this house offers, Caring Wood leads us to fundamentally question how we might live together in the future," said Saunt. "At a time when we are increasingly atomised, individually preoccupied and lost in personalised digital worlds, designing homes where families come together – in their many permutations – is an increasingly important aim," she continued. "Whilst this might seem to be a particular brief for one extended family, it is one taking huge risks in asking how we collectively might live inter-generationally as social structures evolve." Macdonald Wright Architects also designed a barn clad in black-stained timber for the grounds of the house, which act as a maintenance base for the some 25,000 native trees planted in its grounds. Caring Wood was one of 20 properties named on the longlist for this year's RIBA House of the Year award, when it was first announced in June 2016. The list was gradually whittled down to a shortlist of seven, across the four week-duration of the television series. Photography of Caring Wood is by James Morris.